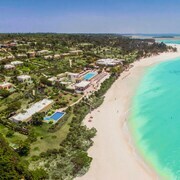 What are the top landmarks in Kendwa? Nothing says holiday like spending a lazy day at Kendwa Beach, a popular beach in Kendwa. While you're in the area, stroll along the sandy beaches. Nothing says holiday like spending a lazy day at Nungwi Beach, a popular beach in Nungwi. Wander the seaside in this relaxing area. Nothing says holiday like spending a lazy day at Kiwengwa Beach, a popular beach in Kiwengwa. While you're here, you can savour the top-notch restaurants. 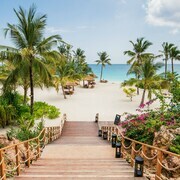 Stay in a palm-leaf cottage on this idyllic resort island, dive along the coral reef and look for dolphins and whales. Drift off under an umbrella at the private beach resort and notice local women working in the seaweed farms of the public section. 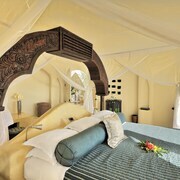 Situated in Kendwa, this hotel is 0.4 mi (0.7 km) from Kendwa Beach and 1.7 mi (2.8 km) from Nungwi Beach. Nungwi Natural Aquarium is 3 mi (4.8 km) away. The grounds were well maintained. 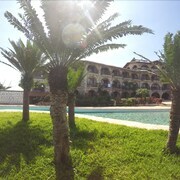 It is a beautiful beachfront property with lots of amenities. The staff is the best part of the resort!!! They were friendly and accommodating. The spa services were amazing!! The only issues I had with the property was that all the restaurants are open-air therefore flies, mosquitos, and other flying insects were harassing us while we ate. I did not enjoy this. We had to wear bug spray every time we went out the room. They need to invest in a good exterminator and the fans that sit at doors of restaurants that keep the flies out. The power kept going out; however, I think this is an island problem and not neccessarily the hotels issue. Our telephone didn’t work in the room. Beautiful! This property is just magnificent. We were greeted warmly and given every bit of courtesy. The food was out of this world. Each meal was an experience in itself. Really, I can't say enough about the excellent food!! The rooms were wonderful and it was so nice to have our own detached little place! The terrace was great to sit out and watch the sunset or practice my yoga in the morning! 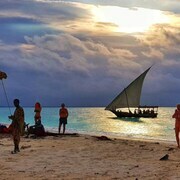 Explore Kendwa with Expedia's Travel Guides to find the best flights, cars, holiday packages and more!